One thing that REALLY irritates me is when I attend a funeral (yes, it does happen from time to time), the minister (if at a Protestant Church - SHOCKING, I have Protestant relatives) or priest will be dressed in white vestments and be celebrating what's called in the Post Vatican II mindset a "Mass of the Resurrection" - as if the Resurrection of the soul with the body has already happened? One MAJOR fault with this kind of mindset, no matter who the relation was with, is that you do not TRULY know if the person is going to Heaven (via Purgatory - trust me, even the saints went through a nano-second of Purgatory) or to Hell. Celebrating a Mass of the Resurrection, with all the comforting talk from priests and bishops PROCLAIMING that the soul is now in Heaven with Our Blessed Lord is NOT what the Church teaches. We are not to assume that any soul is either in Heaven or in Hell. We do not have the power or the authority to make that judgement. The only reason why we have that authority when it comes to souls who are canonized (I do not argue this case with those who have been beatified only because it can get tricky) is because there are several miracles proven without a shadow of a doubt that it was through the intercession of a particular person, thus proving that because a miracle happened, the soul must be in Heavenly bliss with Our Blessed Lord. 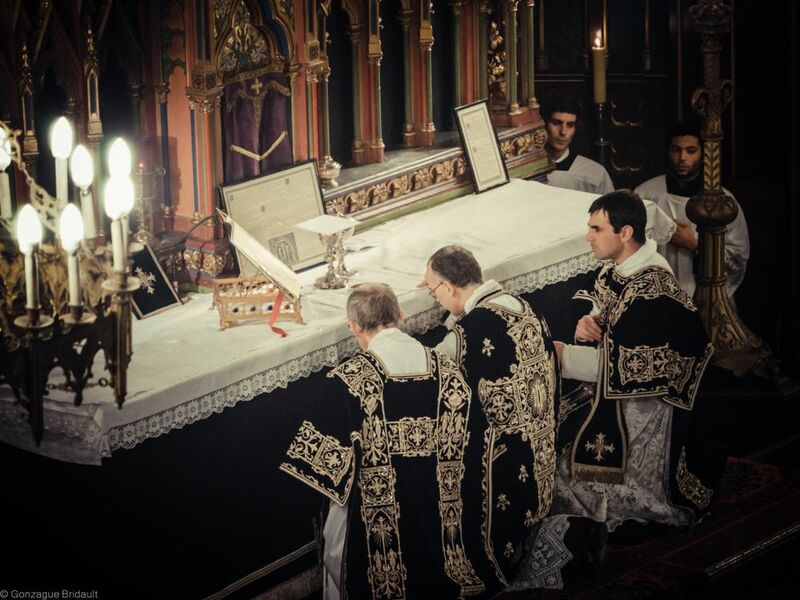 Why then do we use black vestment?! Why, on a day of already great sorrow, is the Church vested in black, the solemnity is "kicked up" to almost as equal to a Good Friday Mass of the Pre-Sanctified? Can we not all just have a "celebration of life" Mass were they take away the reality that a soul has been unnaturally and tragically separated from the body through death and believe that our dearly departed, whom we love and do not wish to offend their memory, is in Heaven already with Our Blessed Lord? The problem with modernized Catholic thinking is that we assume to much! We assume that this liturgical heresy is OK because it's been illegally allowed for five generations. We assume that if we defy what our Supreme Pontiff asks of us that nothing REALLY will happen because of our defiance! I could go on and on! We do NOT assume that any soul, no matter what their religiosity or lack there of, is in Heaven or in Hell. We are MOURNING the loss of a soul - a soul that NO LONGER has the ability to seek Christ's Salvation. Their time is UP! We are truly mourning! We wear black vestments and black clothing to funerals and requiem masses because we are sadden that the judgment of this soul has been forever sealed. All we can do is to pray for the soul, knowing that our prayers may help this particular soul may reach Christ's salvation that NO one is ever guaranteed but is given FREELY by Our Blessed Lord, the Second Part of the Trinity, Jesus Christ. Amen. I am a very traditional Catholic woman, in my mid-50's. I remember when so many of the Vatican II activities started. I am getting my funeral pre-planned and have told my best Catholic friend that I want the black Mass vestments. The problem is that our parish doesn't appear to have any. I am beginning to think I should purchase a set and keep them and then, after my requiem Mass, give them to my parish.... This is expensive, but I really, really want beautiful black vestments. I want the Catholic Faith to shine when I am laid to rest.